From 4th December 2018 the UN summit on Climate will take place in Katowice, Poland (http://www.cop24.katowice.eu/). 24 Conference of the Parties to the United Nations Framework Convention on Climate Change (COP24), 14 Meeting of the Parties to the Kyoto Protocol (CMP 14) and the Conference of Signatories to the Paris Agreement (CMA 1) will be held and about 20 thousand people from 190 countries will participate to the events, including politicians, representatives of non-governmental organizations, scientific community and business sector. 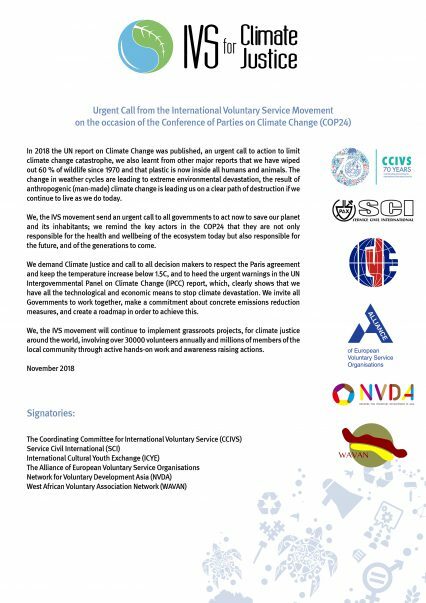 The IVS movement sends an urgent call to the key actors in the COP24 to remind them that they are not only responsible for the health and wellbeing of the ecosystem today but also responsible for the future,and of the generations to come. Download here the call and share it in your websites, Twitter and Facebook pages, and let's stand all together for Climate justice!